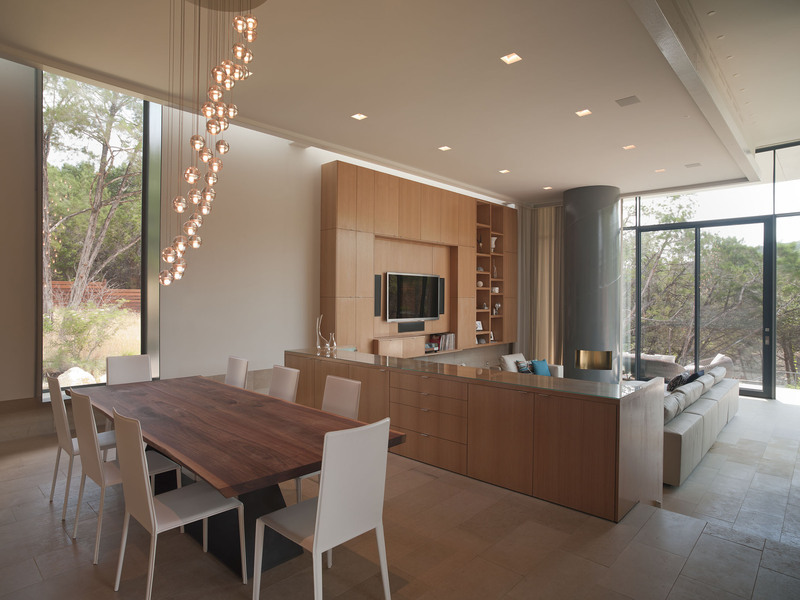 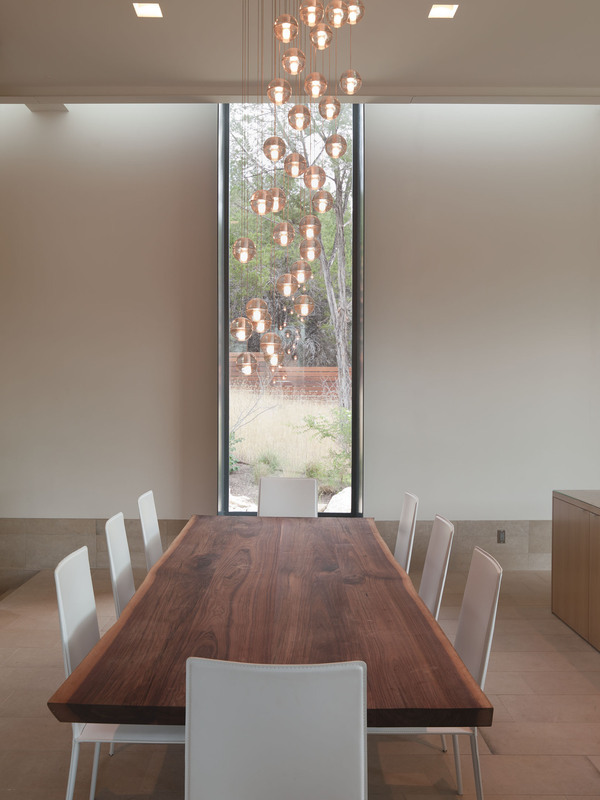 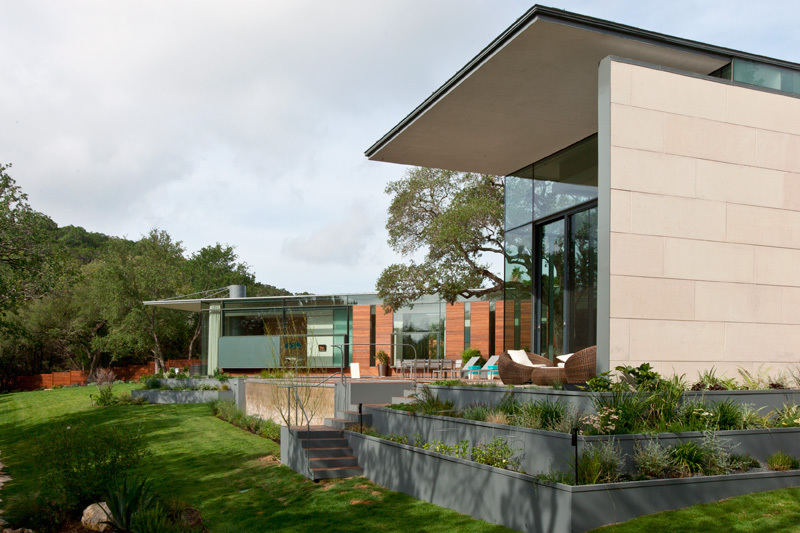 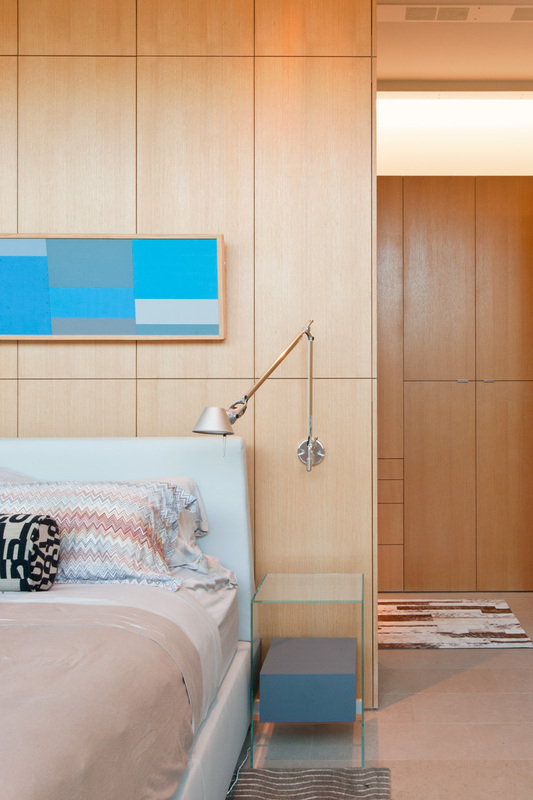 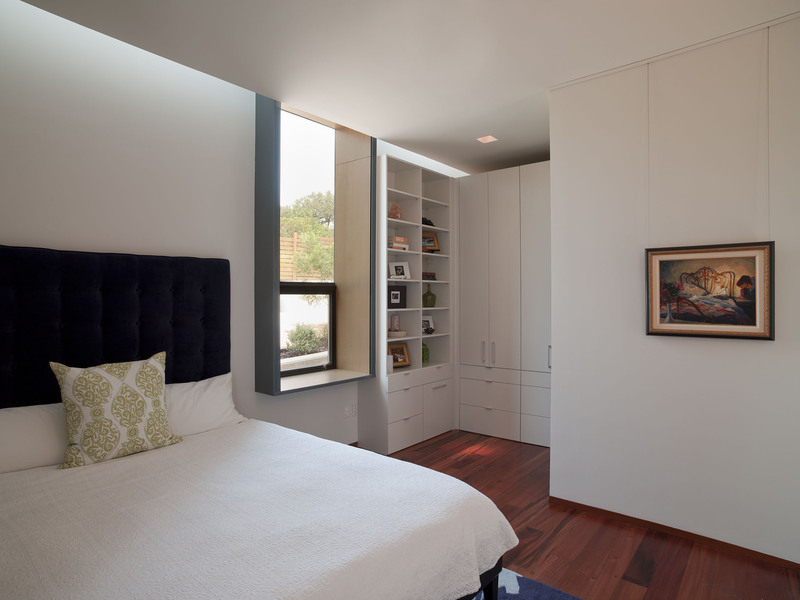 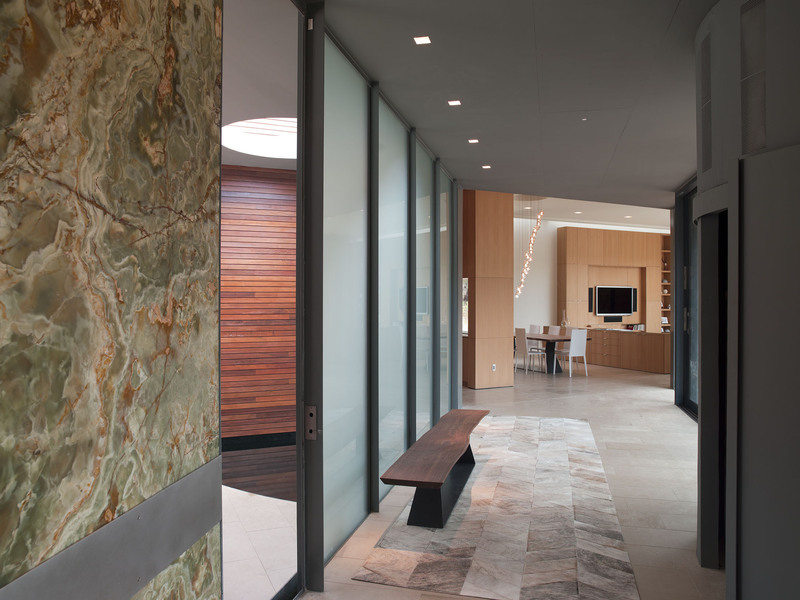 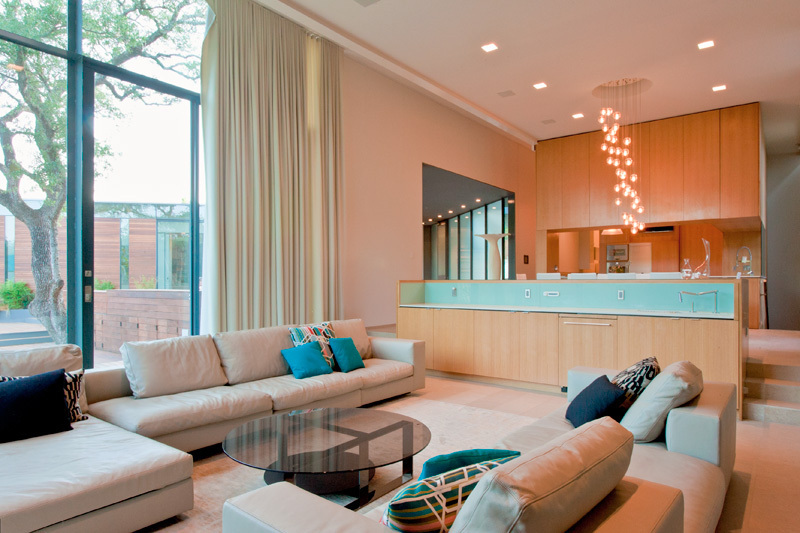 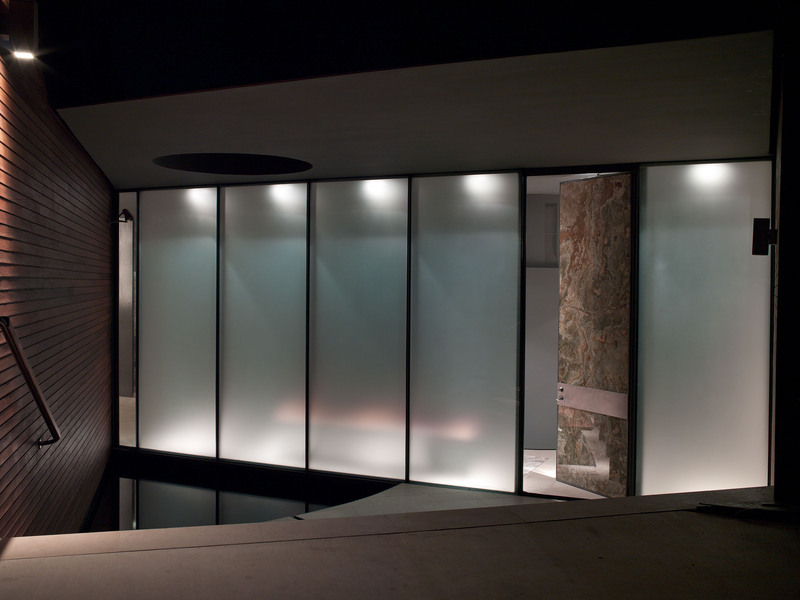 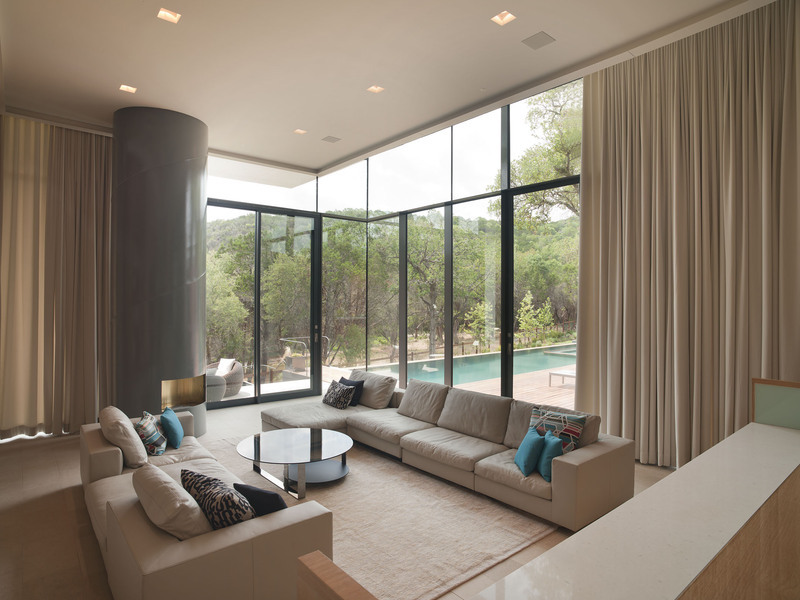 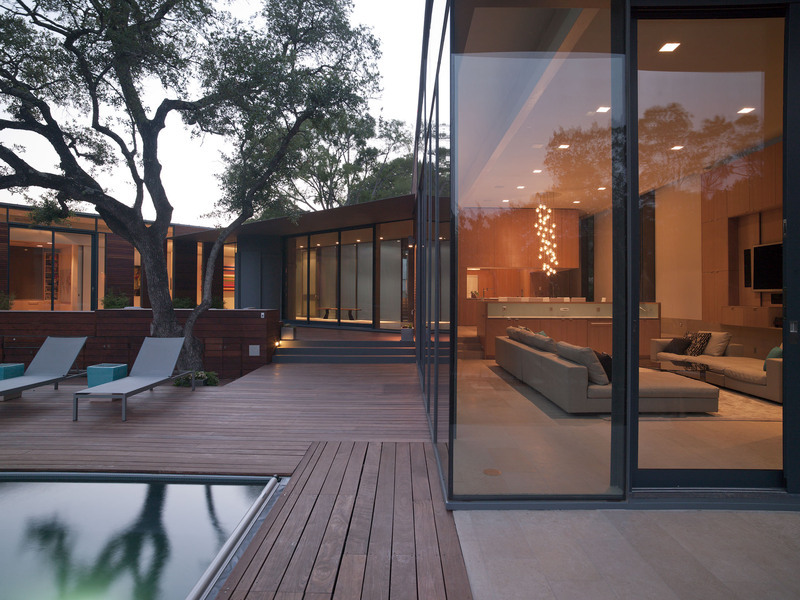 The Cascading Creek House was completed by the Austin based design and construction firm Bercy Chen Studio. 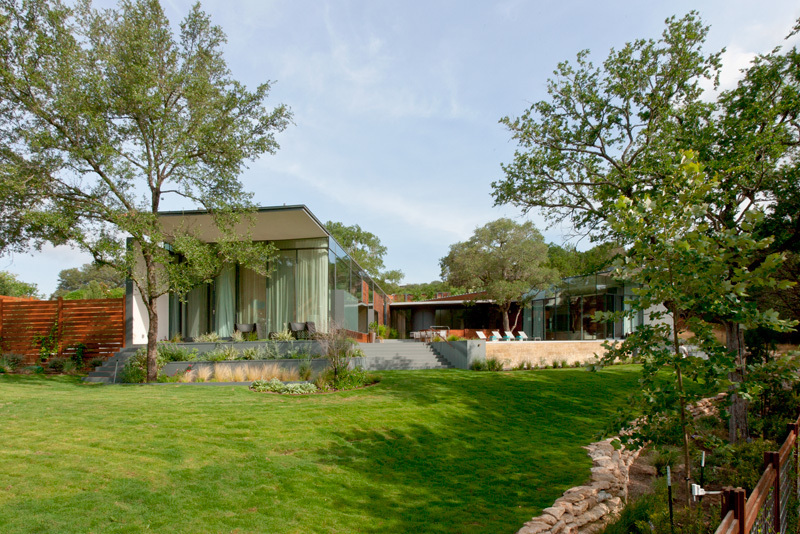 This wonderful modern home is set in the Texas Hill Country, the design incorporates eco-friendly features which minimize the reliance on electricity and gas. 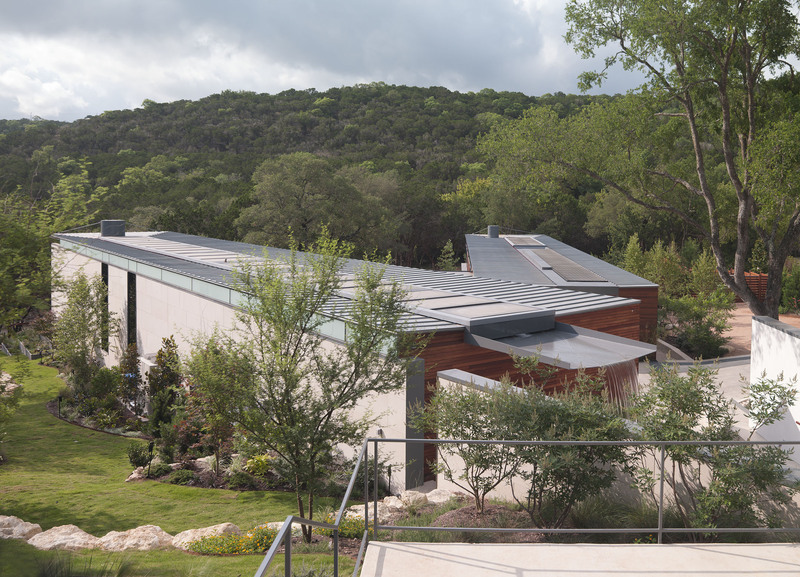 The roof has been shaped for rainwater collection, together with photovoltaic and solar hot-water panels. 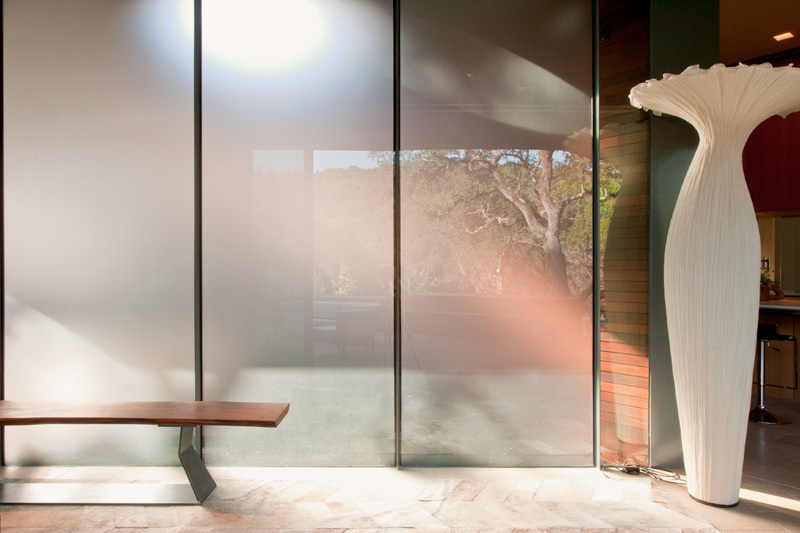 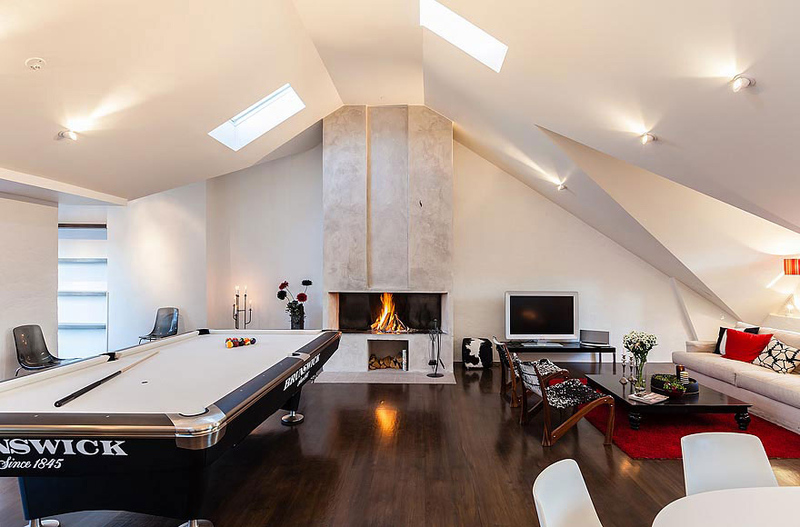 The water, electricity and heat collected from the roof ties into a sophisticated climate conditioning system which utilizes water source heat pumps and radiant loops to supply both the heating and cooling for the residence. 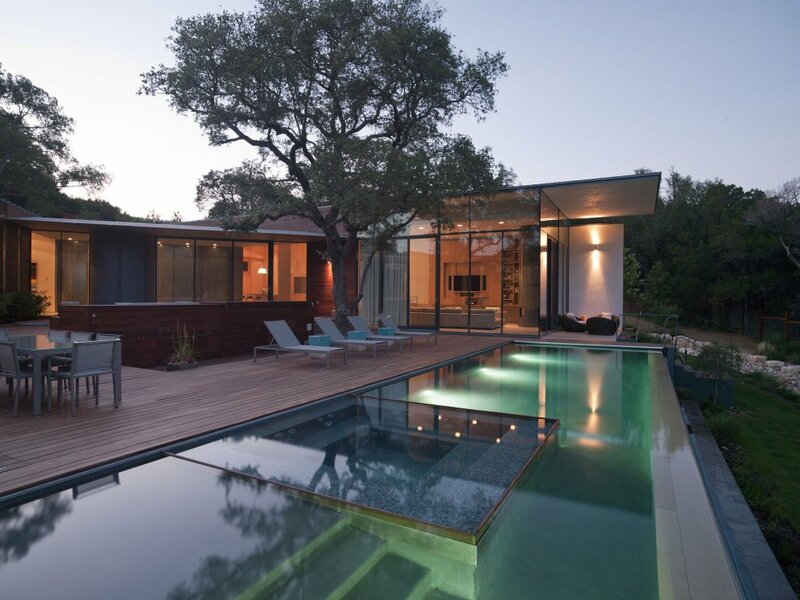 The Cascading Creek House is located in Austin, Texas, USA. 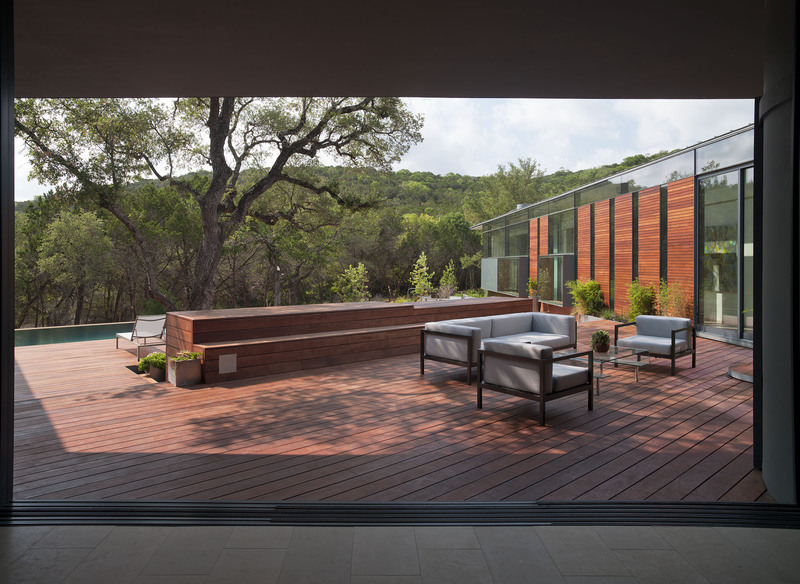 “Cascading Creek House was conceived less as a house and more as an outgrowth of the limestone aquifers of the Central Texas geography. 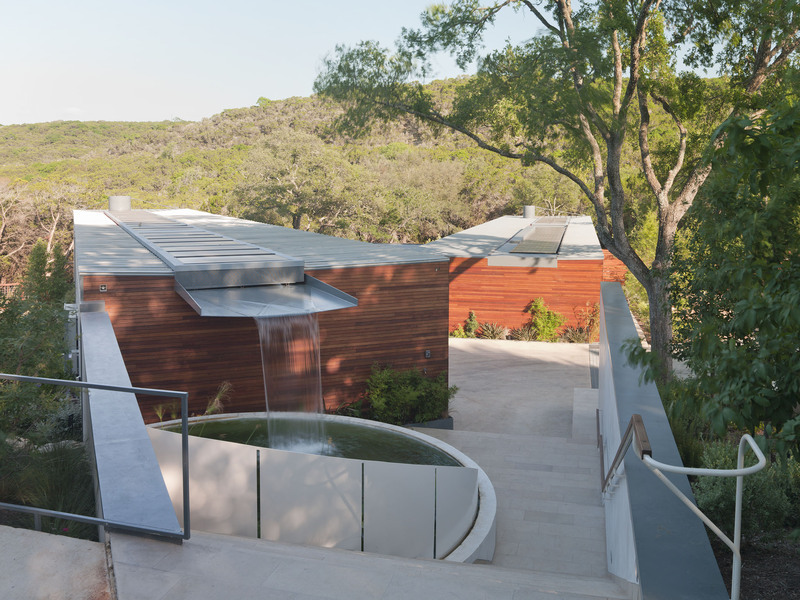 The roof is configured so as to create a natural basin for the collection of rainwater, not unlike the vernal pools found in the outcroppings of the Texas Hill Country. 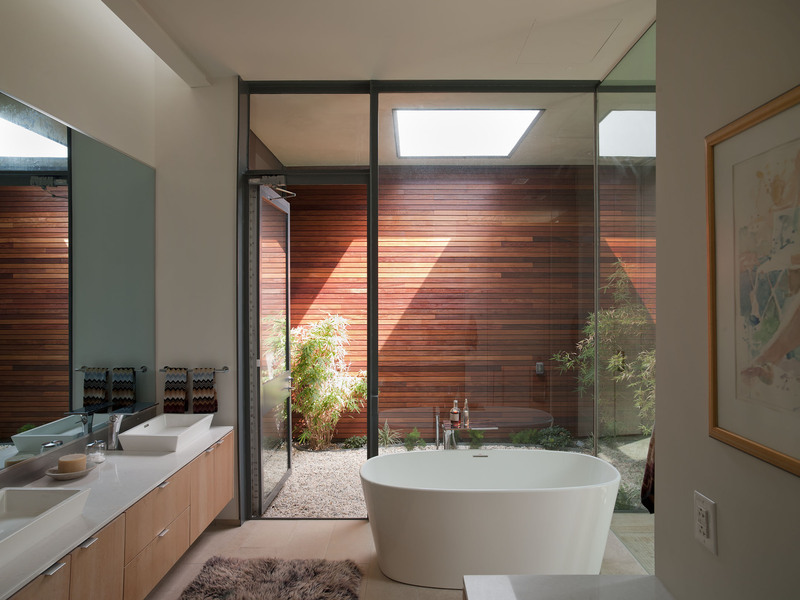 These basins harness additional natural flows through the use of photovoltaic and solar hot-water panels. 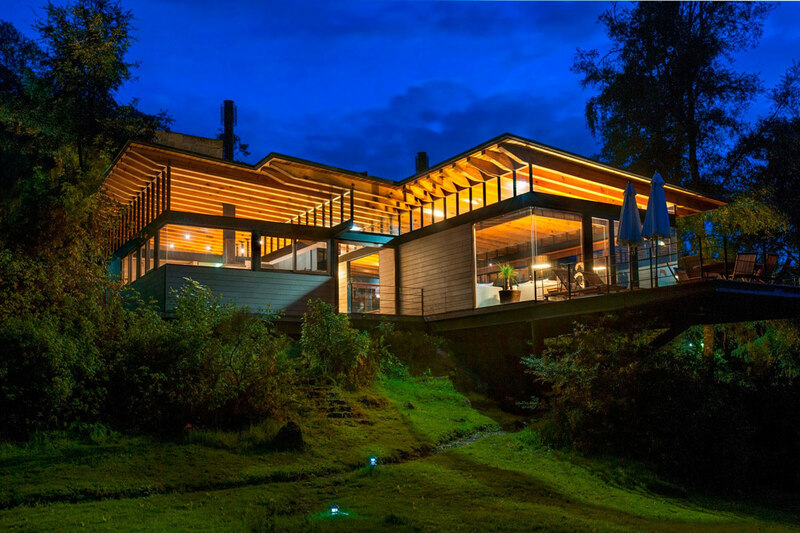 The water, electricity and heat which are harvested on the roof tie into an extensive climate conditioning system which utilizes water source heat pumps and radiant loops to supply both the heating and cooling for the residence. 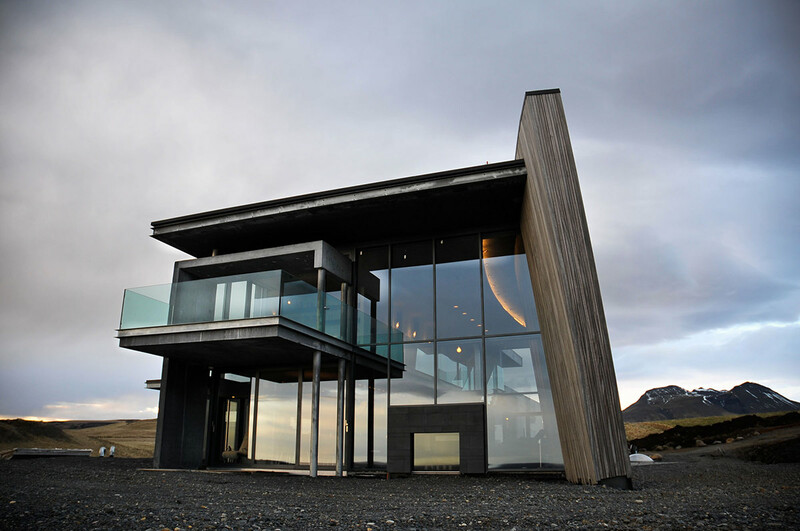 The climate system is connected to geothermal ground loops as well as pools and water features thereby establishing a system of heat exchange which minimizes reliance on electricity or gas. 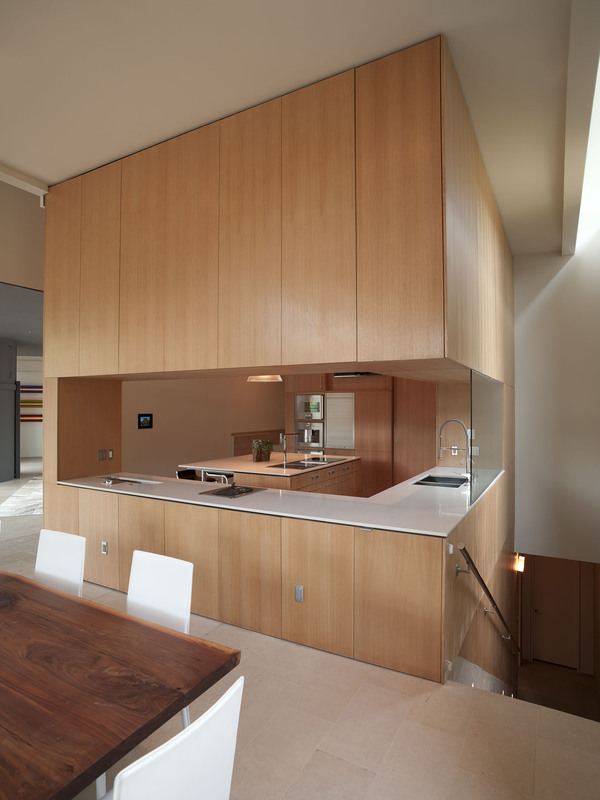 Beyond the technological, the form and siting of the house subtly addresses the social issues of American suburbia. 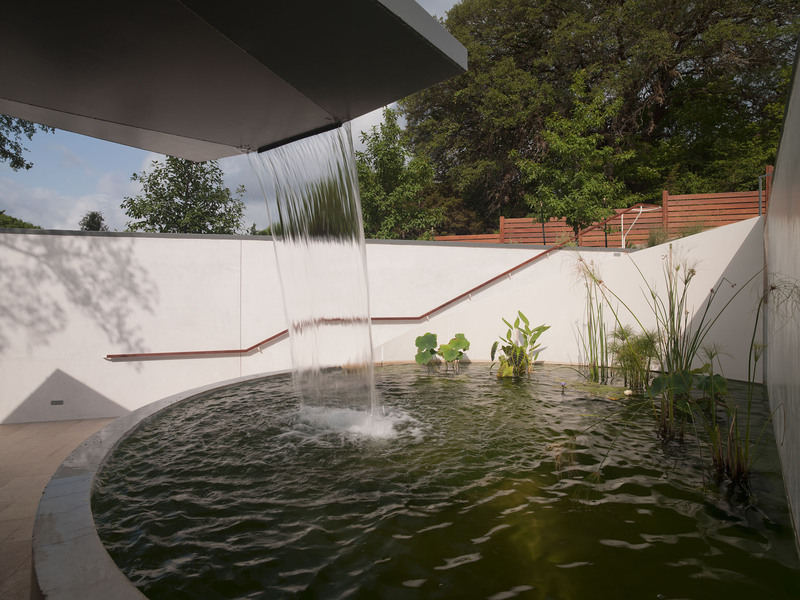 The surprisingly low profile of the house in relation to the street offers a critical alternative to the morphology of massive suburban homes in Texas—one looks down upon the water-collecting roofs of the house upon entering from the street. 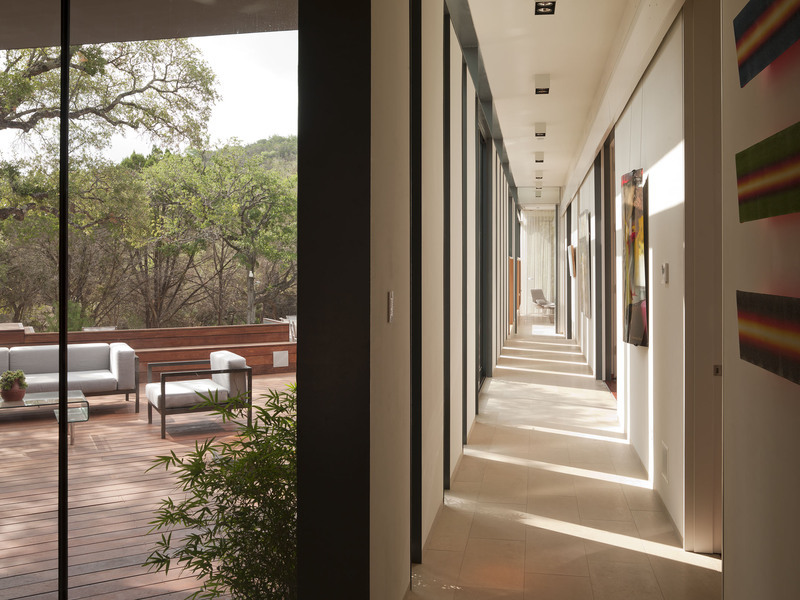 In contrast to the unassuming face towards the street, the residence presents itself generously towards the wilderness below, embracing nature without overwhelming it. 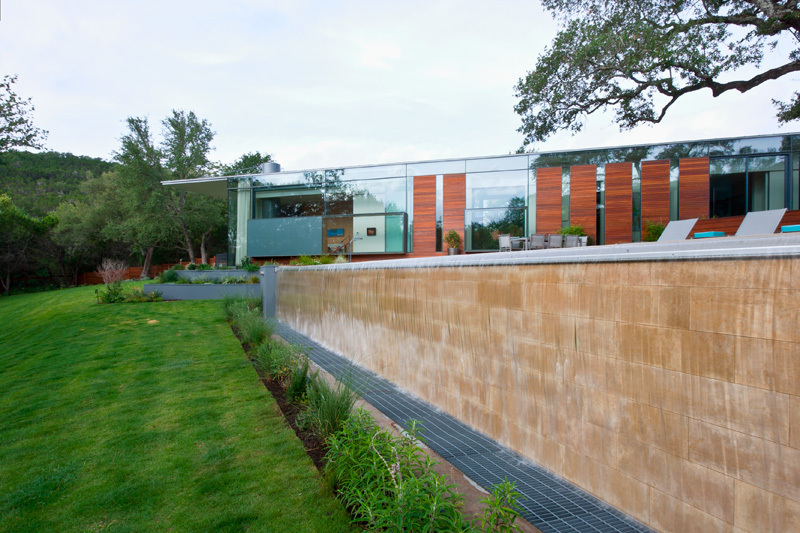 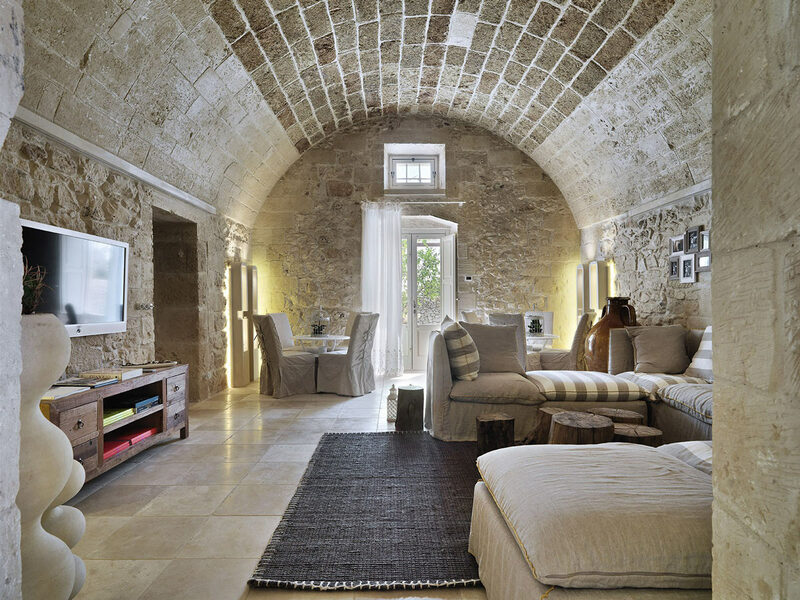 The primary formal gesture of the project inserts two long native limestone walls to the sloping site, serving as spines for the public wing and private wing of the house. 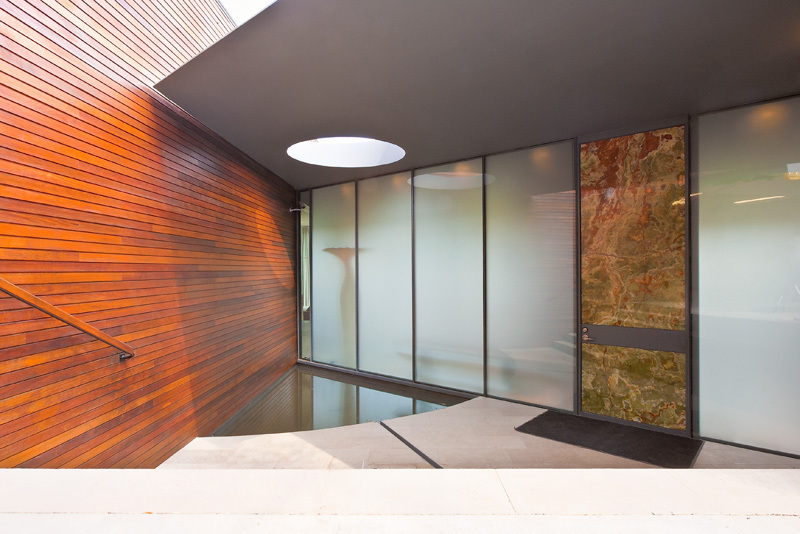 The walls and the wings they delineate shelter a domesticated landscape that serves as an extended living space oriented towards the creek below and protected from the torrents of water draining from the street above during sudden downpours characteristic of the area. 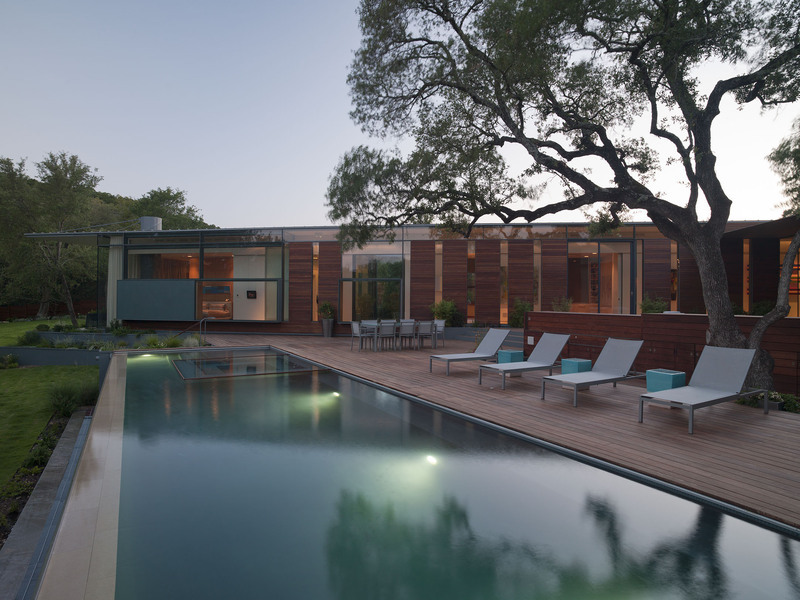 The siting of the boundary walls and building elements was informed by the presence and preservation of three mature native oaks.